When I was in England, I enjoyed eating Shortbread cookies, which are really popular in the British Isles. After all, the most famous Shortbread cookies are probably from Scotland especially the Walker’s Shortbread Cookies brand with the red tartan-like design. I have always thought that Shortbreads are difficult to make or bake. Afterall, it tastes great and has a nice semi-crumbly texture. 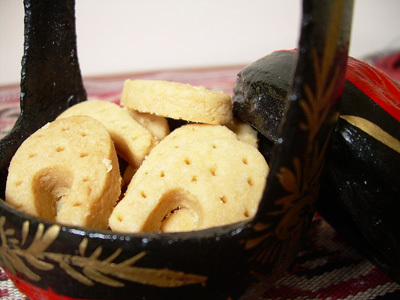 That was until I was introduced to the Shortbread cookies which my mother-in-law baked over Chinese New Year recently. Being her creative self, my mother-in-law baked this cute little Shortbread cookies in horse-shoe design and they were irresistible. We brought back a tin when we came back to Kuala Lumpur. This shortbread recipe was obtained by my mother-in-law about 20 years back but she did not attempt the recipe until the recent Chinese New Year and we were all impressed. When she gave me the recipe, the first thing that ran through my mind was “Is that all there is?”. It is so simple that even a beginner should be able to bake this and impress everyone else. Once you know how to bake this, you shouldn’t be keen to buy them off the shelves anymore. So, are you ready to try and impress? Knead sugar into butter. Add salt. Fold in flour and rice flour. Press on greaseproof paper to about half-inch thick. Cut into desired shapes and prick with pin / toothpick. Bake at 325 degrees F (165 degrees C) for 20 to 25 minutes. Cool thoroughly before storing. thanks for the recipe. might wanna try it cos the recipe i had cannot cut out using cookie cutter. the dough is too soft. noobcook : I think it is worth a risk 😉 I would surely like to see how you would take a picture of this. I love shortbread! I tried your recipe and used the pineapple tart cutter. I didn’t know the cookies would expand so much! Ended up having really ugly ones when they all fused together. But they were quite yummy though not as rich as the walker’s one. Will try again next time, spacing them much further apart. By the way, is there any reason to prick holes? makangirl : Hmmm…strange that it expanded that much. Perhaps you can try again and see if it happens again. The pricking is to allow a more even baking process and supposedly reduces the incidences of air bubbles forming on the baked surface. looks easy. but one question, what do you mean knead sugar into butter, is it beating butter and sugar with electric mixer? Hi there, tks loads for this recipe. I’m really an ardent fan of shortbread. Tried making it this afternoon n……..the mixture was so sticky…it can’t be kneaded so i add more flour n rice flour. The result.. it didnt tasted like Walker’s, it’s a bit soft though. Tot shortbread shld be harder n firm. Why huh…what’s my problem? Pls enlighten me. Many tks. Hello! pls reply asap ok? My son is budding me for shortbread.Tks loads. Jeslyn : Sorry, I missed out your earlier comment. Hmm…this was the recipe which my mom-in-law used and the results from it. Did you completely mixed the sugar and butter by kneading before adding the flour? Hi, I tried your shortbread recipe last Friday, very tasty. Tx alot. I tried out your recipe yesterday, doesn’t work for me, the dough is too dry and doesn’t come together at all. In the end I have to add milk to form the dough. The end result is not good either. Thank you for sharing this recipe. I tried your recipe and the short bread turned out perfect.